I had two interesting experiences over the weekend, totally unrelated to the non-event of Hurricane Irene, which only dropped an inch of rain on northern Virginia. On Friday I went to dinner with a mixed group consisting of the women who are in my wife’s quilting group together with their husbands. All of the men were in their late fifties-early sixties and everyone but me and my wife was an evangelical Christian. One husband was a former employee of an airline and retired but the rest were all recently unemployed, having held management positions that have been made redundant. They have been looking for work but, at their age, they are finding nothing even when willing to take large cuts in pay and benefits. One will be moving back to his family home in Ohio next week because he can no longer afford northern Virginia. I was the only one with an actual job. Two of the men have been prominent in local Democratic Party circles and the remainder vote Republican. All agreed, to my surprise, that the US economy is broken and that it is the result of the wars and globalism that have marched together hand in hand over the past ten years. They also all agreed, even when they do not support specific policies, that Ron Paul is the only honest man running for the presidency. Which is not to say they all would vote for him, but the approval rating was 100%. On Saturday we had a reunion lunch with the CIA Rome Station class of 1980. The last time the whole group was together was shortly before the 2008 election, when everyone but me and my wife indicated that they would be voting for McCain-Palin. This time around it was different. No one in the group has any longer a connection with the government as employee or contractor, so, apart from their pensions, they have no vested interest in who wins the presidency. I was kidded about my Ron Paul bumper sticker but everyone was quick to add seriously that Paul was the only honest man running, that he had predicted the economic collapse, and that his message has been consistent. They even agreed emphatically when I quoted Paul’s pledge to bring the troops home from overseas on the day after he is elected. This is coming from Cold Warriors, mind you, men and women who spent careers doing without question whatever their government asked them to do. Again, no one said they would vote for Ron Paul but nor did anyone say they would not. Which is all to suggest that maybe something is actually going on in the body politic, that people are willing to listen to Ron Paul even though four years ago they would have thought such an idea ridiculous. And he has a passionate base of supporters. Do you remember the scene in the Godfather where Michael Corleone (Al Pacino) sees a Cuban rebel die for his cause and realizes that the insurgents just might win? Recent opinion polls seem to be saying the same thing. Whether or not Dr. Paul can actually win the presidency, his ideas about the state of the US economy and Washington’s catastrophic foreign policy have reached the mainstream and are resonating. 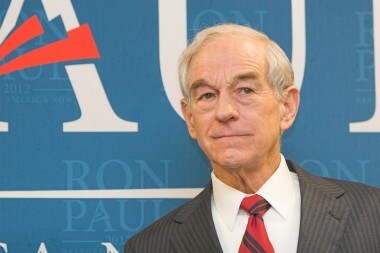 21 Comments to "Whither Ron Paul?" Most people CAN vote for Ron Paul whether he’s nominated by the republican party or (probably) not. Forty-two states permit write-in votes during the presidential election. That is, voters can write-in the name of anyone they please on their ballot for president. Voters can write-in the name Ron Paul for instance. The only states that do not permit write-in votes are HI, LA, NE, NM, NV, OK, SC, SD . Ron Paul will do better this time around, no doubt. That he’s not taken lightly by people like your friends means, with a little momentum, he could become an acceptable nominee. The trouble is, where to get the momentum among people who will vote in the GOP primaries/caucuses (as presumably your friends will not be doing)? In other words; while the general public is *way* more welcoming of Ron Paul’s message than they were in 2008, unless he can push through the ceiling of committed GOP primary voters, normal voters won’t be given a choice. If C. O’Donnell got through the primaries so can Ron Paul. The Tea Party knows the primaries are where the fight is. They will get out for the primaries. They are excited about their candidate. Is Newt going to screw the establishment and endorse Ron Paul? On the Sean Hannity Show (no I don’t listen to Sean, but the station and he was on when I started the car), Gingrich was speaking so I listened. If I’m not mistaken he gave Ron Paul, himself, Bachmann and Romeny as examples of those who are leading now and not waiting until ’12. Also, hinting that he might endorse 1 of the 3. It may just be Newt, but every vote helps. Did anyone else hear that and did I hear it correctly? Encouraging article, but I think his domestic views will sink him when the media stops ignoring him. The Democrats won’t sacrifice the welfare state to get rid of the warfare state. The independents might agree with his foreign policy views, but won’t want to risk their entitlements. Very interesting post. And yes, the story of the catastrophically idiotic US foreign policy in the Middle East seems to be getting out to the general public. When will the masses wake up and realize that both the welfare and warfare state is done or we are done. It is leading to a socio-economic colapse. The article indicates that now finally anyone can plainly see this except the Republican Neo-con base that rule the primary selection process, the establishment ruling class will do everything they can to stop RP and the truths that are finally being told and now even listened to in America. Ron Paul 2012 Rand Paul 2016. PG, I recently rewatched for the umteenth time Godfather Part II on AMC (Rudy Giuliani was the host of Mob Week, which was pretty funny), and I remember being struck by the same scene. I agree with your friends that Ron Paul is an honest man, and I agree with his foreign policy views (not so much his economic views). I would vote for him were he to get the nomination, but I truly don’t think he has a chance of being nominated. Maybe, if a few Paul supporters were to get shot and killed by the police, I might change my mind, but that is as likely as a hurricane hitting New York City. Given that he will be retiring from Congress, Paul has nothing to lose politically, should he fail to win the Republican nomination, by running as a Libertarian or Constitution Party candidate in the general election. I believe that either party would bend whatever rules necessary to make a Paul nomination possible. Forget about Ron Paul running as an “independent,” Libertarian or Constitution Party candidate. If he did so, it would damage his reputation with the GOP, particularly if he cost it the general election, so badly that his son would feel the spill-over effects and his chances of getting the GOP nomination in ’16 would be ruined. IMHO Paul will only run in ’12 if he gets the GOP nomination. In any case, the foundation is being laid nicely for Rand in ’16, assuming we haven’t gone completely off the deep end after what I suspect will be four more years of Obama or perhaps some mainstream GOP continuation of the Bush-Obama presidency in the form of Perry or Romney. Ron Paul is “polling” much higher in my circle of friends than he did last time, that much is for certain. A lot of us have talked about politics a great deal over the past four years (I keep it short, for fear I’ll bore people), but discussions don’t win elections. Pounding the pavement and hitting every house on the block with literature does. I urge everybody who supports Ron to sign up on the official campaign site to walk a precinct. They’ll give you all the support you need, and it makes a huge difference! My family will vote for Ron Paul. I agree with Joe that the Pauls will stay with the GOP. Ron might have to paraphrase Goldwater and say “Grow up, libertarians!” I have long seen a parallel between Goldwater and Reagan in the last century and Ron and Rand in the current one. Phil’s report echoes my own experience. I never paid attention to Ron Paul before 2008. Friends of mine who never knew who he was before now know who he is, and some speak of him respectfully and fairly knowledgeable. That’s a big change, given the media black hole to which he’s been consigned. There is no question that the more people actually take the time to listen to Ron Paul’s ideas, the more people fall in love with him. That the media has been so obvious in ignoring him this time around tells me that some people are panicking. If Paul were elected, many many people would stand to lose billions of dollars in war profits – not to mention the bankers who, we all know, run the world. End the federal reserve, end the imperial profiteering wars, and vote for Ron Paul. This may be our country’s last chance, given the purposeful debasement of the US Dollar. If Ron Paul were to run as an independent candidate of the Democratic-Republican Party (the name of Jefferson’s party), he could win the election in many states. 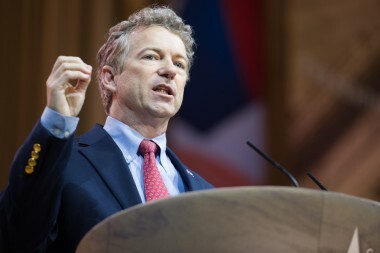 The result of a three way race would be impossible to predict (reason enough for the mainstream media to object), but 1) many Democrats would support Paul, agreeing that ending war in the middle east is a major priority and that President Obama is hopeless regarding the economy; and 2) many of the most energetic and enthusiastic of the small government and libertarian Republicans would support Paul. Unfortunately, it’s likely that no one would win a majority of the electoral votes, and the Republican House would elect the Republican (who would be the corporate/war candidate), even if he came in third in the popular and electoral votes. “…when the media stops ignoring him?” That’s all they have ever done. When Ron Paul was running second in the polls, they did not even mention his name! Even the late night comedians recognized it for what it was. What we need is more objective reporting which gives evidence of facts, not slanted in any direction as opinion. C’mon Sal – I said Irene was a “non-event” IN NORTHERN VIRGINIA!